The paint brush is an essential and iconic tool of any artist. Painting is a truly ancient method of creating, reproducing, and sharing artistic ideas and expressions that are even more varied and innumerable than artists themselves. It takes a truly versatile tool to explore the breadth of potential within the art of painting; through the millennia, paint brushes have proven more than equal to the task! What is a paint brush? Paint brushes are brushes used to apply paint or ink onto a surface, such as such as paper, canvas, wood, or nearly anything else. Paint brushes are made by attaching natural or synthetic bristles to a handle by clamping them on with a piece of metal called a ferule. Yes, it's as simple as it sounds! Paint brushes consist of just three basic parts: the head, the ferrule, and the handle. Head— the actual hairs or bristles of the brush are called the head. The head has three parts: the toe (the very tip of the hairs), the belly (the fattest part of the head), and the heel (where the hairs meet the ferrule). Ferrule— the metal cylinder that attaches the head to the handle is called the ferrule. High quality ferrules are both seamless and non-corrosive. Handle— this is where the brush is held when in use. It's generally made of wood or plastic and is the longest section of the brush. There are all sorts of different kinds of paint brushes, and each different kind has a different handle, ferrule, and bristles. The size and shape of even the most common types of paint brushes vary from one manufacturer to another, but there are certain consistencies common to them all. For example, short handled paint brushes are generally favored for painting in ink or watercolors, while long handled paint brushes are traditional for working with oils and acrylics. You can find great prices on long and short handled brushes and lots more affordable art supplies online at MisterArt.com! Brushes come in a wide variety of sizes, from huge wash brushes to extra-small detail brushes. But rather than list length and width, most brushes simply have a single number printed on their handles. This number is a general indicator of the brush's size. Sizes usually start at 0 and range up to as high as 30. Extra-small brushes are represented by multiples of 0 (which can be listed as 00, 000, 0000 or 2/0, 3/0, 4/0, etc.). The more zeroes there are, the smaller the brush is. The most common brush sizes are 3/0, 2/0, 0, 1, 2, 3, 4, 5, 6, 7, 8, 9, 10, 11, 12, 13, 14, 16, 18, and 20. Maddeningly enough for artists, brush number sizes are not universal. In fact, there can be quite a bit of variation from manufacturer to manufacturer. It's a good idea for artists to consider brush numbering as more of an ordering system than a set-in-stone identifier of a brush's physical dimensions. To help make the process of finding the size paint brush that you need less frustrating, MisterArt.com has developed a handy paint brush size chart that you can use to compare brush sizes. Remember, manufacturers' paint brush sizes vary from company to company, so use it as a general guide. You can thank us later! Once you've picked out the proper-sized paint brush head that you want, though, there's still the matter of handle length. Brushes can be either "long handled" or "short handled." Once again, there is no universal standard for handle length, and the length can change according to the size of the brush. Long handled brushes, though, usually tend to be around 9 in. or longer, while short handled brushes are generally 6 in. or shorter. No matter what size you need, you can find discounted prices on all paint brushes and other art and craft supplies at MisterArt.com. 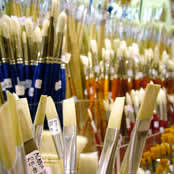 As you might expect by now, artists have a number of paint brush types to choose from. The shape of the paint brush head determines the nature of the stroke that it will make, so it's important for artists to select the proper brushes for their particular needs. Angular—While the body of the angular brush is flat, the edge is angled at a slant. This gives the brush both a flat edge and a "tip," making it great for both wide and thin strokes. Bright—The bright brush is basically the same as a flat but with shorter bristles. The short, flat head of the bright makes it ideally suited for applying broad strokes with a controlled edge. Fan—This brush is easy to spot because of its distinctive fan shaped head. The fan is designed for blending color and softening edges. They're also good for creating feathery strokes when painting objects like clouds, leaves, and grass. Filbert—The filbert has a flat body with a domed edge. Extremely versatile, the filbert can be used as a flat to make broad strokes or as a round for more detailed work. Flat—With its flat body and square edge, the flat is the perfect brush for applying large amounts of color both quickly and evenly. Egbert—The Egbert has a flat ferrule and long, springy hairs that can carry more color than a filbert. It's great for blending and figurative work. Liner—The liner brush has a round, slender head with long hairs. The thin tip makes it perfect for applying minute detail, while the long body allows it to deliver color continuously when painting long lines. This brush type is also called a "rigger" as it is commonly used to paint the rigging on ships. Round—Just as its name implies, this brush has a round head. Its hairs usually taper to a fine point at the end. The round is suited for precise strokes and detail work. Wash—The wash brush is an extra-large flat. It is primarily used for "washing" paper with water when painting with watercolors, or for laying down large amounts of color. Mop—Large and flat, the mop has an oval or rounded edge. The mop is useful for delicately washing a surface and for blending large amounts of color. To help you make a better-informed decision on which brush is best for your project, MisterArt.com has devised a helpful chart of paint brush shapes in which you can view the different paint brush tips side by side. You're welcome! Don't forget, you can find great discounts on each of these brush types at MisterArt.com! The variety doesn't end there! In addition to the variety of sizes, lengths, and shapes in which paint brushes are available, there are quite a number of different kinds of bristles to choose from. Typically, paint brushes are made using bristles of either natural hair or synthetic hair. What are the benefits of using natural hair paint brushes? Natural hair has an outer casing known as a cuticle that is covered in scales and helps the bristles retain moisture. Natural animal hair also has a hollow tube within each filament known as a medulla that allows the hair to absorb moisture. These features make natural hair much more absorbent than synthetic hair, which means that natural hair will always hold more color than its man-made counterpart. Natural hair paint brushes are also wear resistant and work well when used in any medium. What are the benefits of using synthetic hair paint brushes? Synthetic hair paint brushes are less prone than natural hair paint brushes to being damaged by solvents, insects, and harsh paint. Synthetic hair bristles are easier to clean because they lack the ultra-absorbent qualities of natural bristles. Synthetic brushes are also far more durable, making them longer-lasting and better suited than natural brushes to use with acrylics due to their resiliency to the paint's caustic effects. Don't leave a paint brush sitting bristle-side down in a solvent for too long. This can cause the paint brush to lose its shape and make the bristles splay out. When a brush loses its shape, it becomes pretty much useless for art. Clean off paint and solvent residue from your brushes as soon as you're finished painting. Use a little soap and water just to get them nice and clean. This helps keep your brushes fresh and undamaged. Don't use the same natural hair paint brush in two different mediums. Each different kind of paint and the solvents used to clean it affect natural hairs differently. Using the same natural hair paint brush with different kinds of paint will make it wear out faster. MisterArt.com offers everyday discounts on both synthetic and natural paint brushes as well as all the products artists need to care for and maintain them! Filbert— The filbert has a flat body with a domed edge. Extremely versatile, the filbert can be used as a flat to make broad strokes or as a round for more detailed work. I thought the MisterArt.com website was very well done and the shopping experience was ideal. Everything was great. Fast shipping, too.